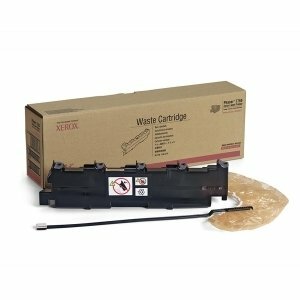 Waste Toner Cartridge is engineered specifically for unparalleled performance with the Phaser 7750 Color Printer. Collects excess toner, delivering flawless, uninterrupted printing. Xerox waste toner cartridges are simple to replace, leaving you with fewer hassles and more time to produce brilliant prints. Designed for use with Xerox Phaser EX7750 and Phaser 7750. Yields 27,000 pages. Marketing Information: Waste Toner Cartridge is engineered specifically for unparalleled performance with the Phaser 7750 Color Printer. Collects excess toner, delivering flawless, uninterrupted printing. Xerox waste toner cartridges are simple to replace, leaving you with fewer hassles and more time to produce brilliant prints. Designed for use with Xerox Phaser EX7750 and Phaser 7750. Yields 27,000 pages.